It’s sad, really, how utterly unsurprising it is–another major boxing weekend has come and gone and instead of appreciating a great fight, fans are largely left to scream in outrage. But while it is not surprising, it is certainly disappointing. 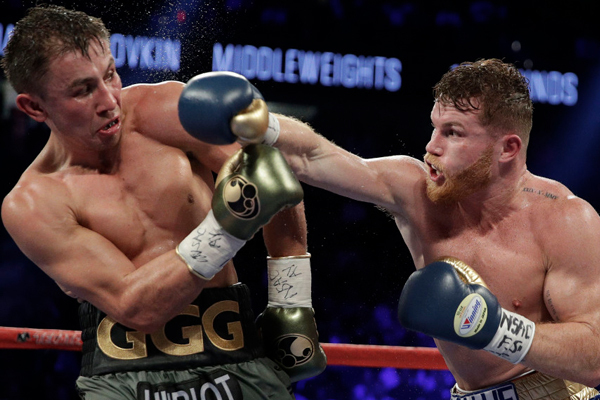 On Saturday night, Gennady Golovkin and Saul Alvarez waged a true battle. Both men displayed high-level skill and true grit. In a boxing universe where the term “champion” gets thrown around carelessly, GGG and Canelo both showed that they deserve the designation. And a draw is a reasonable outcome. It’s how I scored the fight myself. Fans who are convinced that Golovkin clearly won are either overlooking or unaware of how fights are scored. A winner isn’t assigned based upon total punches landed or your general impression of who was coming forward most consistently. Fights are scored on a round-by-round basis and within that three-minute frame, a single multiple-punch combination that took but two or three seconds can be the deciding factor. Golovkin indeed controlled the middle part of the fight. But he started the fight slowly and I gave all of the first three rounds to Alvarez. Those were rounds when not a lot happened, but they still count the same as the more action-packed rounds when you tally them up. At the same time, I have a hard time seeing an argument for Alvarez getting more than six rounds and I can see a case for Golovkin getting up to eight. So with three competent observers scoring that fight, I can only really see two reasonable outcomes–either a draw or else a close decision for GGG. That makes judge Adalaide Byrd’s 118-110 score for Canelo absolutely mind-boggling. And fans are completely justified in their outrage. There is just no excuse for this. Either Byrd is incompetent or corrupt. It’s tough for me to see it as anything but the later. Byrd is a highly experienced judge, who has worked all over the world. I reviewed her decisions going back five years and nothing prior stands out as horrible. She had Shawn Porter defeating Adrien Broner by 114-112, which seems a bit off to me–Porter won much more decisively in my view. She had Carl Froch defeating Mikkel Kessler 10 round to 2 in their rematch–I felt the fight was a little bit closer. But I am nitpicking here–in both fights, she picked the correct winner. Interestingly, she was the only judge who scored Brandon Rios vs. Richar Abril correctly. She scored nine rounds for Abril, while her two colleagues handed Rios one of the most undeserved victories of the past half decade. So this scorecard is way out of character for her. In a sport as corrupt as boxing, there’s no way to avoid suspicion.